Did something for Hide again... This time, he wanted two ushers! I was supposed to be one of them, but I lost my voice after the Hello Kitty Show and didnt want to take the risk of having to speak but not being heard...so I got these two sweet, pretty girls to be the ushers instead! Stephanie and Joyce! 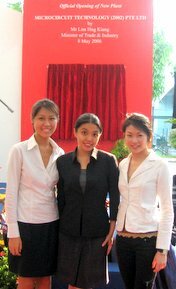 Me, in a picture together with Stephanie on the left and Joyce on the right. Notice I am in formal wear! Hehe I couldn't get the stockings on properly, and decided that even stockings must have a back and a front.... do they? I think dressing up in formal wear is more time consuming than dressing up in my cute costumes! 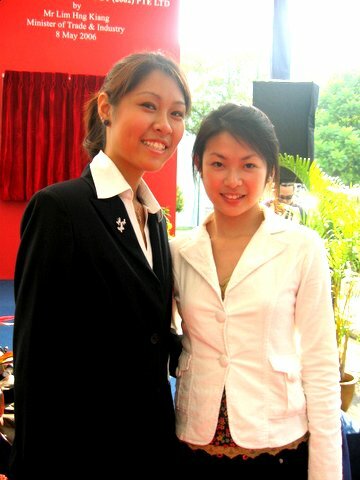 Stephanie and Joyce in a photo together. So yes, I provide pretty girls to usher for your event, but please don't expect them in a bikini or anything too revealing... wholesome beauty is what I prefer to sell, not blatant sexuality.